Jerusalem the ancient capital of Judea had been in Turkish hands since the time of the Crusades. The battle honour was awarded to units who fought in and around the city when it was taken from the Turks in November 1917. The following describes what happened to the 1st Light Horse Regiment. On 14 November 1917 the infantry were now definitely turning their faces eastward towards the passes leading up to Jerusalem, while the bulk of the mounted troops crossed over to the west and carried on the advance up the maritime plain. Next day, after early morning patrols reported all clear for a distance of three kilometres, the regiment moved out in conjunction with the 2nd LH and the Yeomanry Division, with instructions to occupy tactical points west of Ramleh. At 11:45 Ramleh was occupied without opposition, a squadron of the 2nd LH being the first to enter. The 1st LH then pushed on and occupied Ludd at 13:30. The enemy were seen to be retreating in a north-easterly direction on the outskirts of Ludd, and B Squadron under Lieutenant W. H. James was ordered forward to attack the rear of the enemy's column. A Squadron under Captain E.C. Battye was sent to cover the left flank of B Squadron and in spite of heavy hostile artillery and machine gun fire the following were captured: 14 Turkish officers, two German and 283 Turkish other ranks, four machine guns and a damaged motor-car. Lieutenant W.H. James showed great gallantry and dash in collecting prisoners close to the enemy's rearguard, and later was awarded the Military Cross for his work on this and other occasions. The enemy continued to shell, and many of their own men were killed whilst being brought in. Lieutenant Markwell reconnoitred Safiriyeh and found it occupied. The 1st LH casualties were Lieutenants Dowling and McDonald and five men wounded. Lieutenant C.R.T. Parbury was ordered along the railway line towards el Yehudiyeh with a troop to cover the engineers while they blew up the enemy's railway line. The remainder of the regiment bivouacked in Ludd. Two troops under Lieutenants C.S. Frost and S.E. Gregory took charge of the prisoners who were next day handed over to the A.P.M. (Anzac Provost Marshall) at Ramleh. About midday on 16 November the regiment marched out with the brigade for Safiriyeh the 2nd LH acting as advanced guard and getting well shelled. One patrol under Lieutenant G.E. Campbell was sent to reconnoitre Kerfana, which was reported clear. Another patrol under Lieutenant W.D. Jarrett found Sakia strongly held. The regiment bivouacked near Safiriyeh, holding an outpost line with the Camel Corps on the right and the New Zealand Mounted Rifles on the left. Next morning orders were received to move to Yazur, where Major G.H.L. Harris rejoined from the school of instruction and 30 reinforcements arrived. Unfortunately Lieutenant E.S. Dowling died of wounds in the Anzac Hospital Clearing Station on 18 November. Patrols were sent out from Yazur and day observation posts placed, rain falling all day. On 20 November the A Echelon of limbers under Captain W.H. McKeown moved to Mulebbis and drew forage captured from the enemy. The orchards around Yazur were in full bearing and the oranges were fully appreciated by all ranks. An outpost line was taken over that night from the 3rd LH at el Yehudiyeh; contact was maintained with the 2nd Brigade on the right and New Zealand Mounted Rifles on the left. The regiment was relieved next morning by the 2nd Light Horse Brigade and rejoined its own brigade in Yebna. On 22 November the regiment moved with the brigade to Sheikh Abu Jahm, where 24 reinforcements marched in. There was good picking around Yebna, and the opportunity was taken during a halt of a few days to graze the horses. On 25 November the Military Medal was awarded to the following for their conduct at Ludd: 505 Sergeant D. Mychael, 288 Corporal R. Ashworth, and an attached corporal of the A.A.M.C., J. W. Poole. On the same day 103 S.S.M. G.H.S. Cundy was appointed to commissioned rank. The regiment marched to Ayun Kara on 27 November, watering the horses in the village, where 2,000 oranges were bought for the men out of regimental funds. 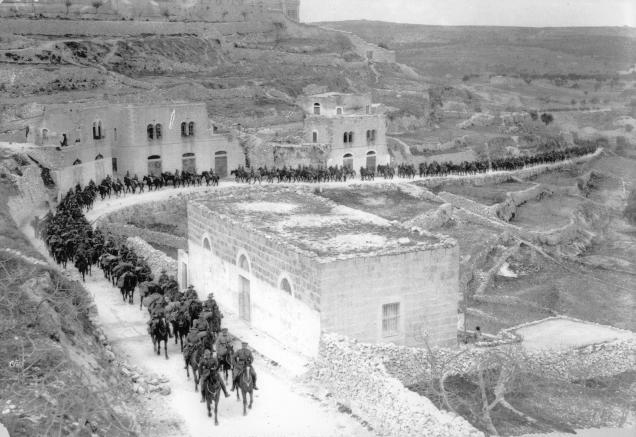 At midnight on 4 December the regiment moved to Jaffa, and bivouacked, moving again on the following night to another camp site and coming directly under the Anzac Mounted Division, whose orders were to be in readiness to reinforce the line at certain points if the enemy attacked. With this object in view Lieutenants Drummond, Parbury, Jarrett, James and Cundy were sent along the different roads to reconnoitre and to act as guides if necessary. However, the enemy contented themselves with shelling only and on 7 December the regiment received orders to rejoin the 1st Light Horse Brigade at Ayun Kara. Heavy rain fell for several days at Ayun Kara, but the health of the men was good. The inhabitants around Richon le Zion treated the men as friends and seemed glad that the Turks had gone, although no doubt many of them were Turkish sympathisers and acted as spies. It was while the regiment was at Richon that word came through that Jerusalem had fallen. The unit was under strength and only enough reinforcements arrived to equalise the evacuations of sick, the new men apparently not being able to stand the wet and the night marches as well as the older soldiers. Wine was purchased from the local winery for issue to the men, and a wet canteen was opened. The enemy had not had time to destroy the winery or any buildings around Richon, but contented themselves by blowing up a few small bridges and culverts on the main road.